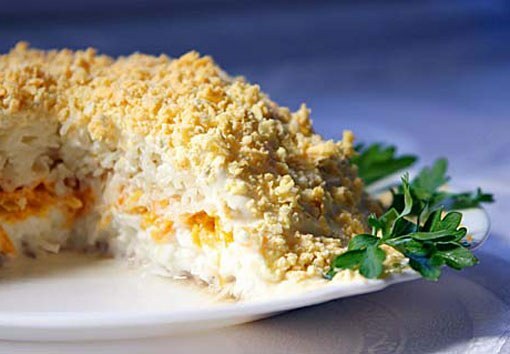 It is impossible to imagine Christmas table without the presence of salad Mimoza. This dish is not only beautiful and elegant, but also very tasty. In addition, this salad does not belong to the category of expensive dishes. Usually salad Mimosa is done with potatoes. However, this ingredient can be replaced with rice that makes the dish even more spicy and interesting taste. To prepare the salad you can choose at their discretion such canned fish as tuna, sardines or salmon. The main thing – to choose a fish in its own juice or in oil. Canned in tomato juice fish this salad will not work. Drain with canned fish juice. Bone discretion, may remove fish or to leave if they are soft. Prepare the other products. Boil the rice. Bring to a boil the carrots. The eggs cook for about ten minutes. Chop finely onions. Prepare the dish. Styling of the salad is more suitable for high transparent dish so that you can see all the layers. Put on the bottom of the Cup Fig. Next, lay out crushed with a fork fish. The next layer should be onion. Lubricate the layer of mayonnaise. Next, separate the cooked yolks from the whites. Proteins crumble using a fine grater, the next layer in the salad. Pour a thin layer of mayonnaise and spread it with a spatula. On top of the protein put grated using a grater carrots. Next is another layer of mayonnaise. The final step in the creation of this salad is the distribution on the surface of lettuce shredded through a grater yolks. Salad can decorate with figures of yolks and whites, and with the help of green and fine lines of mayonnaise. In the preparation of this salad it is important not to mix the layers. To achieve a flat surface of each layer is not difficult, the main thing – to miss the mark each layer with mayonnaise. Boiled vegetables and eggs to cook in advance so they have time to cool down. Ready-made salad, wrap with cling film and briefly go in the fridge. It is important that the lettuce had not been pressed for too long, otherwise it will be less airy. To the Mimosa salad is so light and pleasant to the taste, carefully choose a mayonnaise. This ingredient needs to be of good quality, fresh and non-greasy. On cooking takes no more than thirty minutes. Salad Mimosa will be a great addition to lunch or gala dinner.